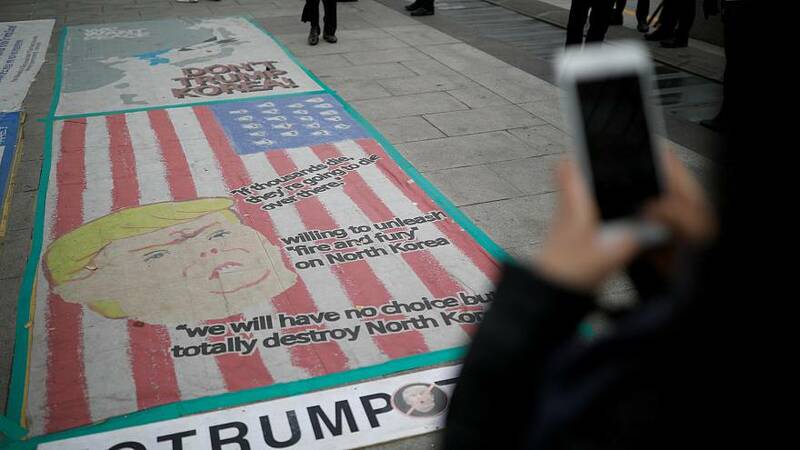 Both protesters and supporters of U.S. President Donald Trump in South Korea have held separate rallies near U.S. embassy in Seoul ahead of his visit to the country. About 30 people consisting of Won Buddhism believers and civic group members urged Trump to come up with a dialogue with North Korea rather than pressure. Won Buddhism believers marched down Seoul street while conducting a three steps, one bow ritual, wishing peace on the Korean peninsula. Meanwhile about 40 people welcomed Trump’s visit by waving U.S. flags and singing the South Korean national anthem during the rally. Trump will visit South Korea as part of his Asia tour from Tuesday (November 7), where he is expected to discuss North Korea’s nuclear and missile programme. Earlier in the day, South Korea imposed unilateral sanctions on 18 North Koreans, barring any financial transactions between those sanctioned and any South Koreans, as part of international efforts to dry up Pyongyang’s illegal cash flows.